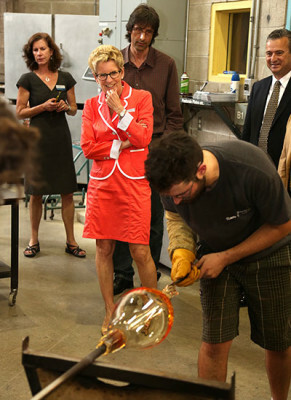 Ontario Premier Kathleen Wynne observed while students demonstrated their crafts. Sheridan students and faculty members greeted Ontario Premier Kathleen Wynne at Trafalgar Campus on Friday. The premier made a rare appearance to take a personal tour of the Crafts and Design building located in the A-Wing. And indeed, the premier spoke positively about her experience. The premier said that she was especially impressed by Sheridan’s woodworking program, where student projects have an impact on the community. Wynne added that Ontario is currently dealing with serious skill gaps, which is why it’s important to have programs that allow young people to develop the skills that are needed in the world, and to understand what the possibilities are. “Sheridan’s doing a great job on that front,” she said. The special tour included viewings of the furniture, glass and ceramic studios, the art gallery and the newly constructed digital fabrication lab. Zabudsky said that the visit was especially nice because the Premier toured the different Crafts and Design programs, and she was able to talk to students and watch them in action. Faculty members were also given the opportunity to meet with the premier. Zabudsky added that Wynne would take fond memories of Sheridan back with her to Queen’s Park. FOR MORE INFORMATION, BE SURE TO WATCH THE VIDEO BY GREG LONGLEY. TO SEE ADDITIONAL COVERAGE OF THE EVENT, CHECK OUT THE STORIFY PAGE. 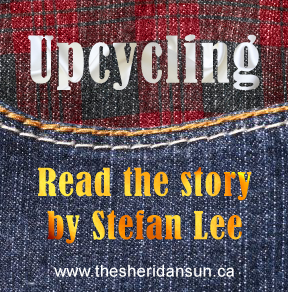 TO VIEW THE TWITTER PAGE FOR THE SHERIDAN SUN, CLICK HERE. Added by Melissa Gervais on September 24, 2013.